We work all over the NYC area and provide all of our customers with Top Notch Customer Service. Our job #1 is to provide unrivaled service so that we can create lifelong, happy customers. We don’t want our customers to have to deal with unresponsive customer service when we can provide you with service that will exceed your expectations! How do we ensure that we are offering Top Notch Customer Service? If you are a part of our White Glove Experience, you will have direct access to your rep and the owner of our company. Sure, it may cost a bit more but can you really afford to have problems with your copiers and have to wait for a solution? 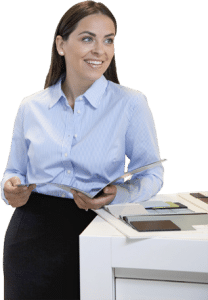 We will educate you about your copier so that if you do have an issue that can be easily remedied with the swapping out of toner or ink, you will be able to do it yourself without the need for a tech visit. We want to empower you to make the call. If you need us to come out to repair your copier, our techs will be happy to oblige! We are here to help you no matter what type of business you run. From large enterprise to small home offices, we promise to provide the same great service and attention as we do to the next person. For Top Notch Customer Service, look no further!